Veterans Day is a perfect opportunity to reflect on what our U. S. soldiers have done for our country. It’s a time to thank, support, and pray for our American veterans. Our soldiers have put themselves in the line of fire, risked, and given their lives for our freedom. Our freedom should never be taken for granted. Our soldiers have fought hard, so we can live in comfort. Thank a vet, in person. I have not yet a met a veteran, who doesn’t appreciate the words, “Thank you for your service.” I’ve received replies such as, “You’re welcome…Glad to do it…Yes ma’am.” I’ve also received the tip of a hat. Hold the door for a veteran with a cane, offer to let a veteran get in line before you at the grocery store, and smile at a veteran. Offer a handshake, and say, “Thank you for your service.” These are all ways to show respect and appreciation for their sacrifices they have made for our country. Most of us personally know, and love, an American Veteran. My husband served five years as a helicopter crew chief in the Army. He served half his tour flying generals, and the other half on medivac duty. I’m proud to be married to an Army veteran! There are many ways to support our soldiers, and show that we care. We’ve donated socks and t-shirts to Walter Reed National Military Medical Center, where our nation’s heroes are healed. We’ve donated to charitable organizations, which help veterans when they come back home. Our favorite way to support soldiers, is to send Christmas boxes filled with favorite items for our troops. It’s become a family tradition to put them together every Thanksgiving. Something small, becomes something bigger, when many come together to help boost the morale of our country’s brave men and women. Praying for our American soldiers, is the most important way we can give thanks for their service. Praying provides God’s protection over our brave men and women. We can ask people to join us in praying for our soldiers and their families. Some soldiers are just beginning their journey. Some soldiers are in danger. Some soldiers are coming home. Some soldiers are coping with physical and emotional disabilities. Some soldiers have gone to be with Jesus. Prayer brings our soldiers a silver lining. It brings them spiritual protection and healing that can only come from God. Lives are saved, people are healed, and soldiers on their journey find eternal life through Jesus. Thank you, veterans and soldiers. God bless you, and God bless America. 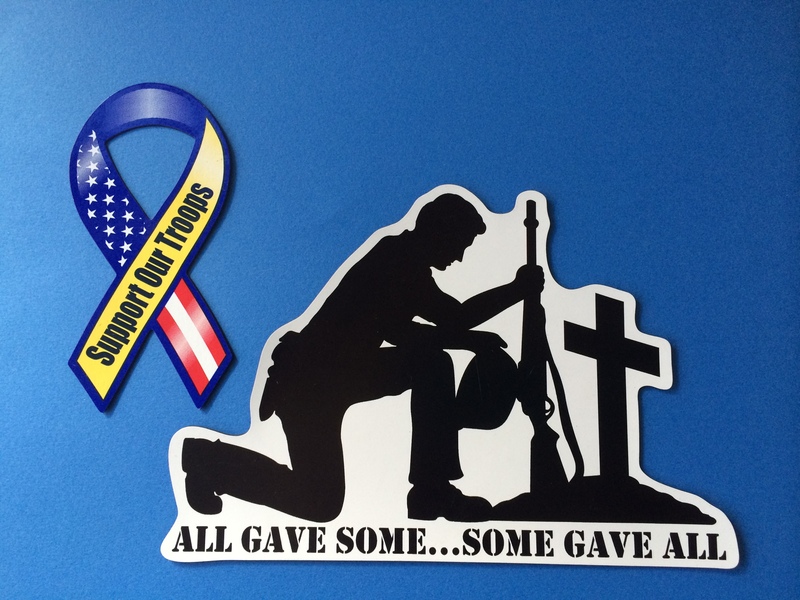 Car magnets purchased by a veteran organization, in order to support veterans, and show appreciation for their service. Send Support Our Troops® Care Paks, to aid in the welfare and morale of service members deployed to protect all of us in the United States. Send holiday cards to show concern and appreciation, for service members, veterans, and familes recovering at Walter Reed Bethesda.